Korean Exchange Students: Hear Their Voices! What’s the funniest/weirdest moment you’ve had since you’ve been here so far? In my first day of class, almost everybody chose to sit across from me because I was new. It seemed like they were as scared as I was! How is your experience here different from that at home? How do you feel about the difference? I like how SM is more close-knit, cozy and diverse. In classes, because of the small size, teachers are closer to students, and students have the chance to participate more. I really like the school meeting at SM because it is relaxing and fun, and sometimes there is meaningful content like the video about Devin. In KIS we only have serious, formal monthly community meetings in the auditorium. For the same reason, I like the chapel talks too. Furthermore, I really appreciate the free blocks I have here at SM because we don’t have free blocks in KIS, even though we have many more assignments there. I like how I have time to take a rest here. Finally, SM has a much more diverse community, and I love the diversity here. People are not afraid of differences, and they respect one another’s culture. I think that such open-mindedness is really important. What would you say to someone who is considering an exchange program, either a student from SM or KIS? I would definitely recommend it! It might be challenging, but you will love it! It gives you great experiences and a lot of new friends. You will discover a new self. Harry is even seriously thinking about transferring to SM. Don’t be intimidated by something you have not tried yet. I was surprised to find out that sometimes teachers allow students to have “second breakfast” or work in places of their choice during class. Such occasions are definitely not possible at KIS. The classes here at SM are more engaging because it incorporates more discussion compared to the lecture-based classes at KIS. Also, there is a greater emphasis on “non-academic knowledge” here, like how to be a better person. For example, in my social justice class, the Gray colloquium speaker came in and talked for almost the whole period. This would not happen at KIS, where covering course material would be the priority. In addition, I like how SM is more cozy and people-oriented. I think this derives from the long history of the school. Finally, the buildings here have character. In KIS, buildings all have an industrial look because they are recently constructed. You will need to prepare for being open-minded about differences and new experiences. It might be discomforting at first, because you might feel like you are not “owning the place.” But it is exactly this out-of-comfort-zone experience that teaches you things that you cannot learn in your own culture. Even if you regret going on the program, it is better to regret doing it than to regret having the experience at all! My mother is from Mongul; my dad is from China; but I was born in Korea. I think the biggest difference is that students at SM participate more in class. In KIS, students rarely ask questions. Also, SM gives students more freedom. For example, you can keep food in the dorm, you have free periods, and you can go back to your dorm room during the academic day if you have free time. Just try it! I think putting yourself in a new environment is important. You can make new friends, and you will feel refreshed. Once I played 80 hrs of video games in 5 days. I think it’s the overall difference. Korean culture is more conservative, so it shocked me a little bit to see people wearing minimal clothes in dorms. KIS has many rules that SM doesn’t have, such as no food in the dorm and no phone at night/during class. Classes here are more discussion-based and therefore encourage more student participation. The SM campus is really big, so there are more resources, like the PFAC building that is specifically dedicated to art. I also like the natural elements on campus. I do miss the air conditioning at KIS though. After coming to SM, I would definitely recommend any exchange program. You will be impressed by the new perspectives in a different culture, even from countries close to your home country. My name is actually Sophia, not Sophie. It’s misspelt in the email address. Today (Nov. 6th) was my birthday! I can sleep for 14 hours straight but I usually only get to sleep 6-7 hours a day in Korea (because of the amount of work of course). I felt kind of weird when people asked me how much English I speak because it's a very unusual thing to ask in Korea. If some foreigners speak or understand Korean well, we just assume that they have mastered it for a while or have lived in Korea. Another thing I found weird is that people are allowed to use their phones during classes. In KIS, boarders do not get their phones until school ends, and day students are punished alike if they are caught using phones. I find the spirit week very fun. 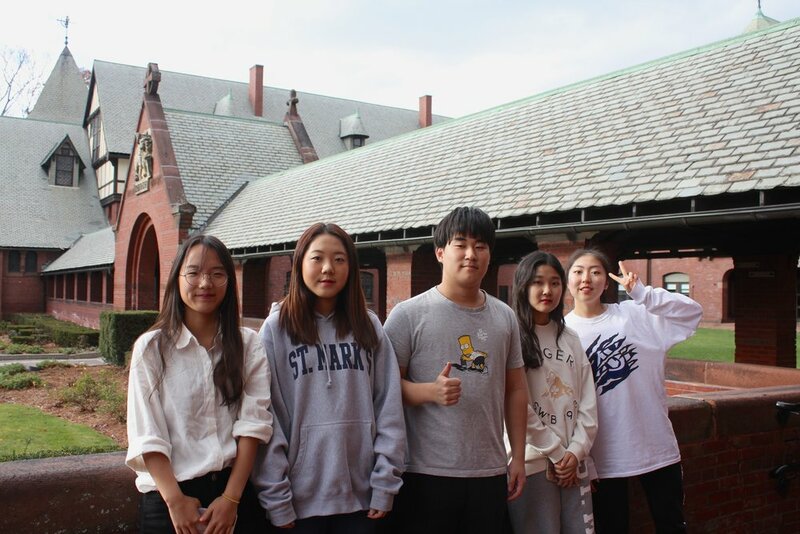 Back at home we compete with other schools (there are only four international schools in Jeju island) vigorously for sports too, but there is not as much tension as there is in the rivalry between SM and Groton. In KIS we don’t have free periods, but study hall instead. We are not allowed to enter the dorm until school ends, and we have to get out of the dorm by 7:45 in the morning. Because there aren’t that many regulations, dorms at SM feel more like a home than a dormitory. Another difference is that at KIS we don’t have sports practice every single day. We only have 2 hours of practice twice or thrice a week, depending on the team. Also, at KIS, we have a lot more ongoing assignments and projects at the same time. A lot of students tend to sleep late at night. I would highly recommend an exchange program to anyone who gets to have the opportunity to do so. Just try everything you can. Don't regret after missing the chance! If there is work that you need to do for the homeschool, (for me there is a lot, especially notetaking for Global Studies and Chemistry) please finish that earlier so that you can fully enjoy your exchange experience!